Gem is Sean's best friend. 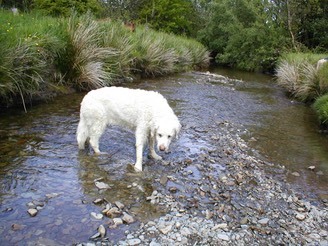 He decided that he would like his own dog when he was 13yrs old and Gem was a gift to him from our friends Debbie and David Summers, who bred her. Debbie and Marie were very careful in selecting a puppy from the litter who would be a suitable first dog for a Sean. 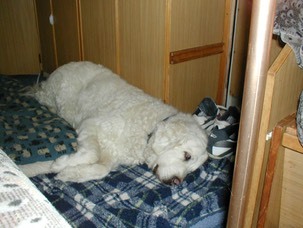 Gem had an accident when she was only a few weeks old which resulted in her jaw being broken in two places. It was skillfully repaired by David (who is a vet) and the only lasting sign is that her bottom two canine teeth never developed. It was the way that Gem took all this in her stride and had such a sunny personality, in spite of a very frightening incident, that made her stand out as a dog who would be so tolerant of a young first time owner's potential mistakes. 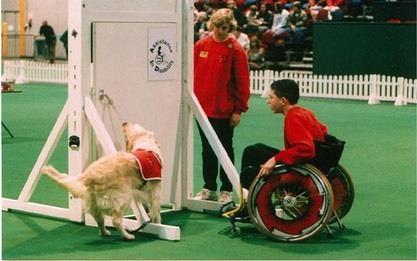 Debbie and Marie were right about that .... but wrong about Sean's potential to be totally a responsible dog owner! From day one, this was a match made in heaven. Sean came home from school every lunch time to spend time with 'his girl', fed, groomed, trained and looked after her, without having to be reminded of his responsibilities. Although they share a home with Marie, John and four other dogs, nobody could ever doubt that she gives her first love and loyalty to Sean. 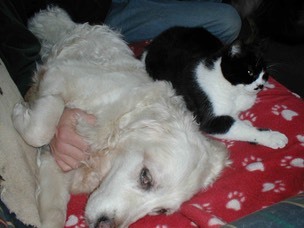 Gem's best friend Sean was at her side when she passed away peacefully at home on 30th Jaunuary 2008. 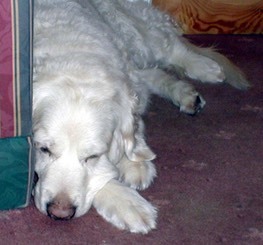 It is the first time in thirty years that our home has been without a Golden Retriever. There may be another one day when Sean is ready to welcome another golden girl into our home. In her honour Sarah Fisher and Marie Miller have dedicated their new book "100 Ways to Train the Perfect Dog" to Gem. 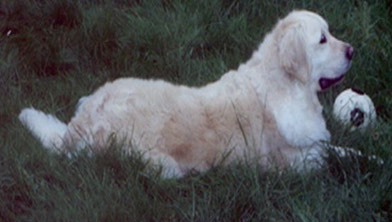 The inscription reads, "Dedicated to Gem (24th February 1994 - 30th January 2008), Sean's friend, companion and soulmate; a very special Golden Retriever who truly was the perfect dog."